John Curtis is a well-known Bristol artist who specialises in urban landscapes and whose work is recognisable from his use of colours and long lines. I have only seen studio pieces by this artist before, so it was interesting to see how his work translated to a large wall. If I am honest it is exactly the same, only bigger. Brilliant really. I think that this is a picture of Park Street in Bristol looking up at the Wills Memorial building up on the right hand side, although it might be somewhere else altogether. I love the night-time atmosphere that is brought to life in this piece. Highly accomplished and highly recommended to look at in the flesh It is in the passage way into the courtyard of the Steam Crane pub at the end of North Street. We used to eat at Jamie’s Italian on Park Street reasonably often as it was a restaurant that the whole family liked. Sadly his business overstretched itself and had to close a whole ton of branches, including this one in Bristol. On the upside though, the hoarding on the outside has been beautifully decorated with a Cheba and Inkie collaboration. This piece speaks volumes about the independent and individual culture of Bristol – that street art is sanctioned and even encouraged onto one of the most iconic shopping streets in the city and that the piece itself is bright and cheery and a bold statement of pride about the street itself. The work was sponsored by the Bristol Buisness Improvement District (BID) and was painted at the start of July. Looking at the artwork itself, it is quite difficult to see an Inkie piece and not read the word Inkie in it. I swear I read Inkie whenever I see it. Cheba dose what Cheba does and provides a splendid cosmic backdrop for the letters. A fine collaboration and ‘in your face’ (in a nice way) piece of Bristol street art. Standing on the bridge at the bottom of Park Street looking North East, you are treated to the most wonderful stencil by Banksy. 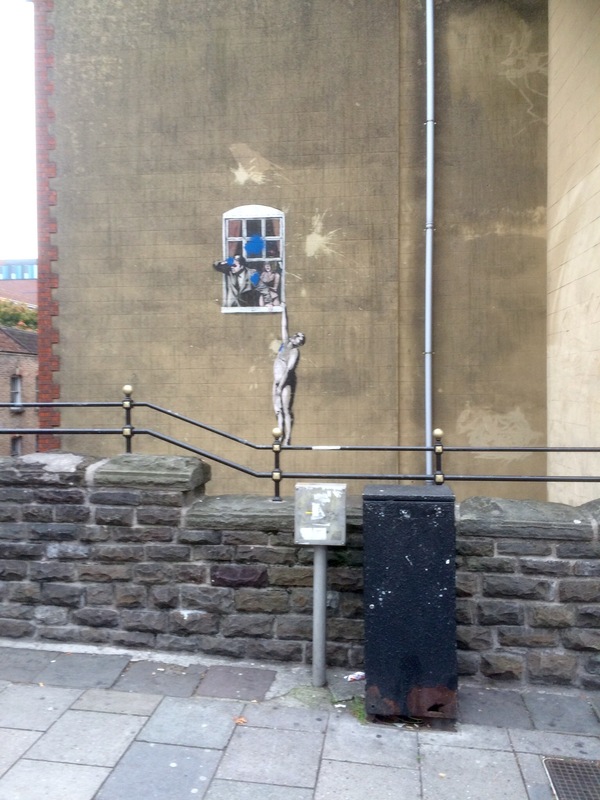 ‘Man hanging’ which probably goes by several different names was sprayed in 2006, and led to something of a watershed in a permissive stance from the Bristol City Council regarding what was then called graffiti. There is a lovely article written at the time from the BBC website. How things have come on in relatively few years. 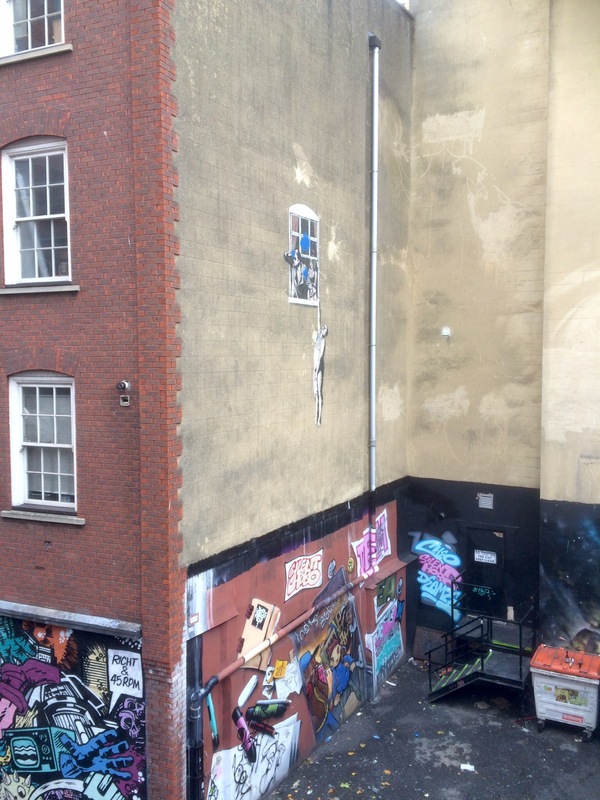 I am fortunate enough to walk past this iconic Banksy twice a day at least, and I am never bored by it. In 2009 the work was attacked with blue paint, calling into question all sorts of difficult conversations about street art and graffiti and vandalism and ‘he had it coming to him for selling out’ etc etc. For me it is just a pity. It seems that with his art, if you are not there in the first day or two, it will get damaged or removed.